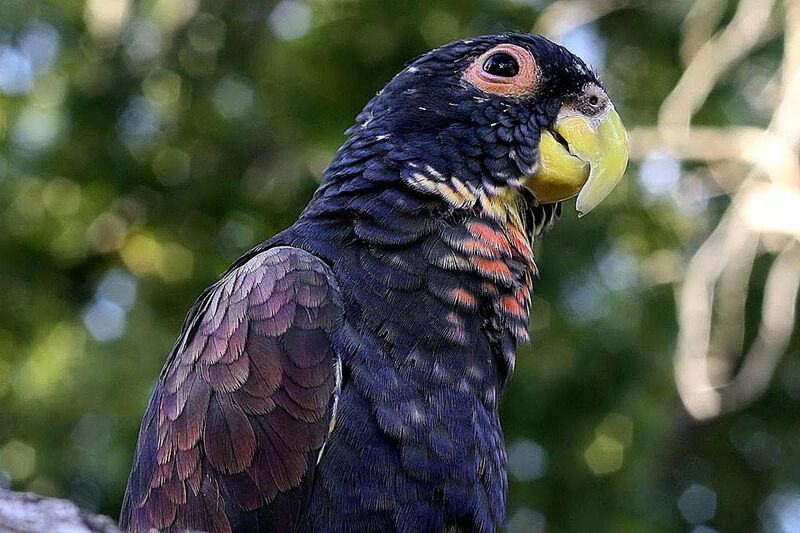 Like many other types of Pionus parrots, the Bronze-Winged Pionus hails from South America. These birds prefer to spend their time in the woodlands and forested areas as opposed to plains, as they like to seek shelter and cover in the foliage. Popular in captivity, the Bronze-Winged Pionus can be found in pet homes all over the world. Not a bird that has several nicknames like some other species, these are known simply as the Bronze-Winged Pionus, although the name is sometimes hyphenated to read Bronze-Winged Pionus. The Bronze-Winged Pionus is most accurately described as a medium-sized parrot, measuring in at around 11 inches in length from head to tail at maturity. They are often described as having a squat or stocky body type and weigh between 7 and 9 ounces as adults. While they aren't an especially large parrot, it's worth mentioning that the Bronze-Winged Pionus always appreciates a large cage. If you're considering adopting one of these birds, plan to set your feathered friend up with the largest accommodations that you can manage. Like other types of parrots, the Bronze-Winged Pionus can live for a very long time when kept as a pet. A good general life expectancy for these birds would be in the neighborhood of 25 years, provided that they receive proper care. However, it's important to remember that this can vary greatly among individual birds depending on the quality of their diets, the cleanliness of their habitats, and other factors. A good rule is to opt not to adopt one of these birds unless you are prepared to make a commitment to care for your pet for up to 30 years. The Bronze-Winged Pionus is known for having a gentle and calm disposition for a parrot. They form very strong bonds with their owners, and they revel in being able to spend time with them. Plenty of social interaction is an important key to the successful keeping of a Bronze-Winged Pionus. Those interested in adopting one of these birds should make sure that they can devote a significant amount of each day to playing and interacting with their pet. Some Bronze-Winged Pionus may have a tendency to become "one person" birds, showing extreme devotion to their owners and shunning attention from other people. Those adopting a young Bronze-Winged Pionus are encouraged to have their entire family interact with the bird regularly, in an effort to prevent this type of behavior. These are very uniquely colored birds -- once you know what a Bronze-Winged Pionus looks like, you aren't likely to forget! Mature adult birds display mostly dark bluish-purple plumage that is peppered with white and pink feathers under their chins and on their chests. They have a pink ring of bare skin around their eyes, a yellow beak, and light, flesh-colored legs, and feet. The feathers on their shoulders and backs are predominantly a bronze-green color, which gives these birds their name. There is a red patch of feathers underneath their tails, a characteristic of all Pionus parrots. Like all pet birds, the Bronze-Winged Pionus does best on a diet that consists of a high-quality seed and pellet mix, combined and supplemented with a variety of fresh foods such as fruits, vegetables, berries, and nuts. These are extremely active birds, and they need to be given an ample amount of time outside of their cages each day to exercise and work their muscles. As a rule, you should provide a Bronze-Winged Pionus with a minimum of 3 - 4 hours per day outside of the cage. To keep the bird occupied, try giving him or her an assortment of safe toys to play with during their out of cage time. This will help keep your bird mentally as well as physically stimulated.